Iranian supreme leader Ayatollah Ali Khamenei Monday accused the country’s regional top foes, namely Saudi Arabia and its ally, United Arab Emirates (UAE), of having paid attackers of the Saturday parade in the south of the country. “Based on reports, this cowardly act was done by people the Americans call to help when they are trapped in Syria and Iraq, and are paid by Saudi Arabia and the UAE,” Khamenei said on his official website. 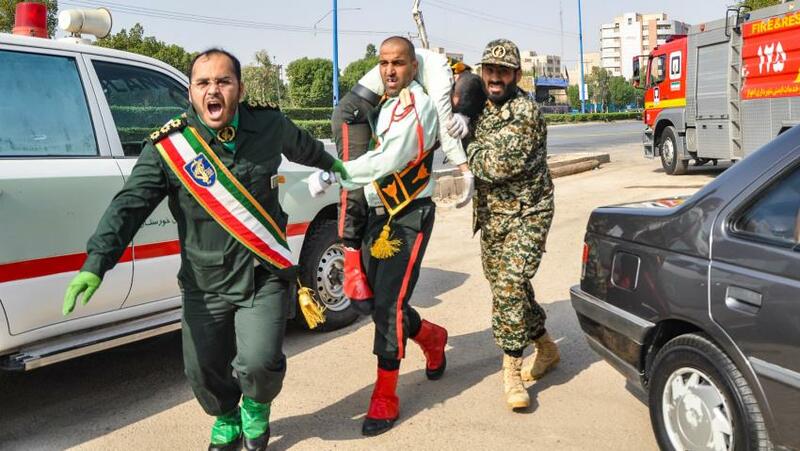 Twenty-nine people, including at least 12 members of the Revolutions Guards, died Saturday at a military parade in southwest Iran. The Islamic State group (ISIS) claimed responsibility of the attack in a video on its Amaq news agency. On Monday, state-backed Fars news agency indicated that forces killed five attackers. Four of them have been identified bar the fifth whose body according to the news agency was mixed up with other casualties. Soon after the attack, a blizzard of statements from Tehran accused Saudi Arabia, the UAE, U.S. and Israel for sponsoring the attack that the deputy commander of the Revolutionary Guard, Hossein Salami, said will be not left unanswered. He promised a crushing and devastating revenge. Tehran also summoned the UAE’s chargé d’affaires to protest the “irresponsible” statements made by an adviser to the Abu Dhabi government, Abdul Khaleq Abdulla. Abdul Khaleq Abdulla justified the attack on Twitter, arguing that it was part of a plan to fight Iran on its own territory. “An attack on a military target is not a terrorist act. Moving the battle to deep inside Iran is an option that has been publicly declared and will increase in the coming phase,” said Abdul Khaleq Abdulla said shortly after the attack. Abu Dhabi swiftly blasted Tehran’s accusations noting that they were baseless. Iran on one side and Saudi Arabia and the UAE on the other are currently embroiled in a proxy war in Yemen. The Saudi side blames Iran for supporting Houthi rebels who have conquered vast swathes of the Yemeni territory including capital Sana’a. Saudi and Emirati forces have entered the fight since 2015 in a move to roll back gains made by the Houthi rebels. Posted by KanelkaTagba on Sep 25 2018. Filed under Gulf News, Headlines. You can follow any responses to this entry through the RSS 2.0. Both comments and pings are currently closed.